Thirty year old PRC technician Yuan Zhenghua (袁振华) who allegedly caused a fatal accident at the Budget Terminal last Saturday will be remanded at the Institute of Mental Health (IMH) to evaluate his ‘mental state’. Yuan was charged in court on Friday with “dangerous driving causing death, driving without a valid licence and driving the cab without valid insurance policy.” He appeared to be ‘calm’ when the charges were read to him in court. All the sentences for the above offences carry a maximum penalty of a jail term between three months and five years only. Yuan was already charged with ‘voluntarily causing hurt in robbery’ which could see him jailed for up to 20 years and at least 12 strokes of cane. The prosecution has requested Yuan to be remanded for further assessment of his mental condition and the trial will begin on 5 April next month. The tragic accident triggered an outcry in Singapore with many calling for a ‘harsh’ penalty to be imposed on Yuan. PRC netizens in Singapore are organizing a donation drive online to raise funds for the family of the late Chandra Mogan, a Malaysian cleaning supervisor who was killed after a hijacked taxi driven by a PRC man hit him along the driveway of the Budget Terminal last Saturday morning. “GreatHua” wrote that the donation drive was started not only to provide comfort and compensation to the family of the deceased, but to allow them to express their guilt and regret at the accident committed by a fellow ‘comrade’. He added that it will help unite mainland Chinese living in Singapore and to salvage their embattled image. Judging from the response so far, many PRC netizens are supportive of the donation drive and are actively spreading the message on social media. 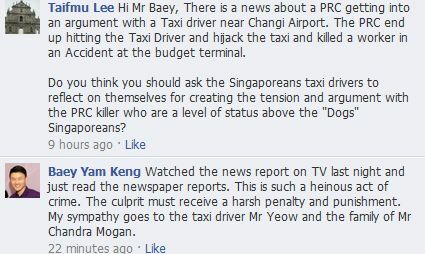 Meanwhile, Changi Airport Group has opened a donation channel to the public to help the family of Chandra Mogan. For cash donations, there is a collection box at the CAG corporate reception, located on Level 4 of Terminal 2. Under the Work Injury Compensation Act, Mr Mogan’s family could also claim up to that amount in damages against his employer. The wife of deceased cleaner Chandra Mogan, who was killed in a fatal accident caused by a PRC man who hijacked a taxi on Saturday morning, expressed her worries about the future after her husband’s tragic passing. 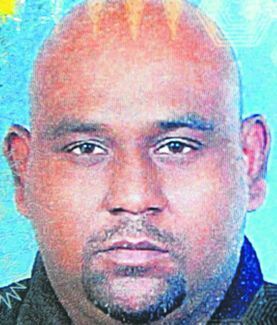 34 year old cleaning supervisor Chandra Mogan from Malaysia was on duty that morning when he was hit by a ComfortDelgro taxi by a PRC man who hijacked it earlier after assaulting the driver. His family is in Johor and he’s said to have four children, with the youngest about four months old. His wife Madam Pusparani, who was working at Terminal 3 when the accident happened, fainted on the spot after reaching the accident scene. They were married for twelve years. “Our children were his life. He was so excited when we had a girl, because he had always wanted a daughter. He bought her so many things, and now he is gone,” she said in an interview with the media. A teary Madam Pusparani said she had three meals a day together with her husband and they would leave from their home in Johor Bahru to work at 9 pm every night. “How am I going to support my four children with a monthly salary of only S$1,200?” she added. Meanwhile, the PRC man has been charged with ‘voluntarily causing hurt in armed robbery’ at Changi General Hospital where he is currently warded for treatment of his injuries sustained during the accident.